Soak in the sun and spectacular views from The Bay House. This is a very special modern home designed for maximum enjoyment of Beautiful panoramic views and easy living. This home is Handicapped Accessible with elevators, and has special upgraded amenities to help accommodate wheelchairs. Located on Long Beach Island, the Bay House is situated on Barnegat Bay just a short two block walk to the wide sandy beaches on the ocean side. 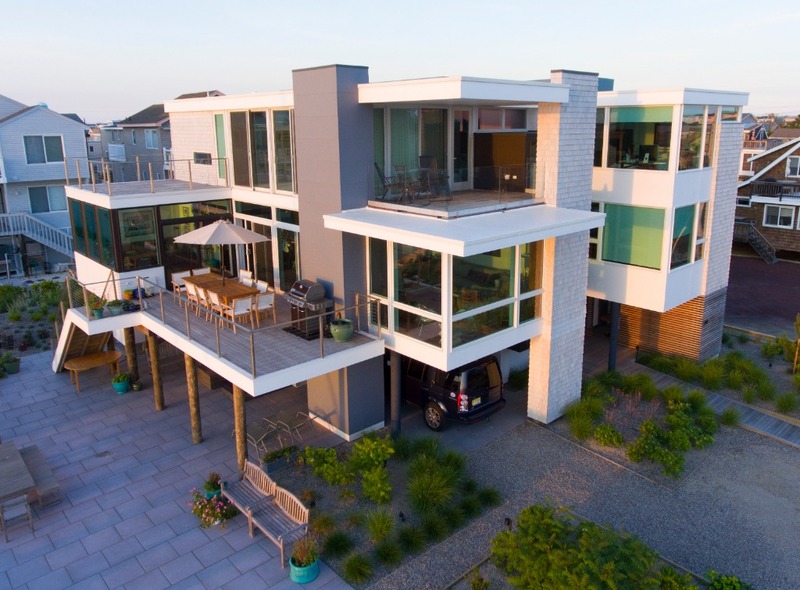 Recently built by the award-winning firm, Midouhas Architects, The Bay House features an open floor plan consisting of a fully equipped gourmet kitchen, spacious living room, dining room, and sunroom, all with breathtaking views of the bay. This amazing home has a main living area that opens out to a large deck, complete with a grill and an outdoor dining set which comfortably seats up to ten people. A laundry area is conveniently located on the main floor along with a powder room. Use the cozy den, also on the main floor, as an extra bedroom, complete with twin daybeds, TV, closet and a private full bath. The sunroom has a queen size pull out with a spectacular view of the bay. The second floor features the “Master Suite” with its own spa style bathroom, and private deck. Large sliding doors with a glass railing create the feel of being on a cruise ship as you lie in bed and take in the view. The bathroom has a Jacuzzi tub and roll in shower. A second covered deck is reached by both the master bedroom and hallway. The “Corner Suite” bedroom also has expansive bay views and a full private bath. The third bedroom has two twin beds and an adjoining full bath. All bathrooms have “rain” style showers. The large bay front patio provides another outdoor dining area, with an additional large grill and comfortable seating area. There are two large outdoor showers; one bay side and one oceanside. Take the two kayaks that come with the house out for a sunset paddle, use the two bikes for island cruising, or enjoy walking to the many local restaurants, shops and activities. The house comes with 8 beach badges. The Bay House is the ideal restorative getaway for couples, families and friends. Not a pet free home, owner has a cat. Garage use is for storage only.